built from timber from the Oscar F. Avery farm in 1864 at a cost of $35.00. Mr. Avery donated the lumber. Desks and folding seats, ink wells and recitation benches were used. The first teacher was Albert Adams; then Frank Atherton, Ervin Rich, Ollie Buck and Rosa Smith. The first directors were Orlando Godden, J. W. King, J. S. Hopkins, Ed Stinson, and Lyman Booth. The main subjects were reading, writing and arithmetic. The McGuffey Readers, Copy Books for Writing and Appleton Arithmetic were used. and church services. 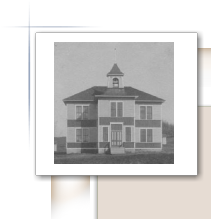 The second schoolhouse in town was built in 1892 at the cost of $2,500 on Out lot 4 on the south side of King Avenue. It was a two-story building with four class rooms, a belfry, and a cloakroom. Later it was moved to Main Street and used as the I. O. O. F. Hall and recreation center. The well was on the southwest corner of the school yard and a board walk ran along the south side of Percy Street to up-town. E. W. Parker, superintendent, assisted by Miss Hoffman and Mrs. Lizzie Hills, taught 125 students in ten grades. 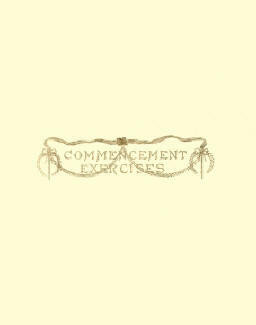 The first class graduated in 1895. 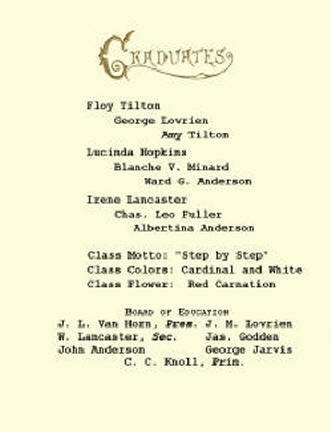 The high school alumni was organized the following year. Ten grades were taught until the fall of 1911 when the eleventh grade was added and in 1917 the twelfth was added. school. The first buses were drawn by horses and had side drapes in the windows. In bad weather they rode in a bobsled. 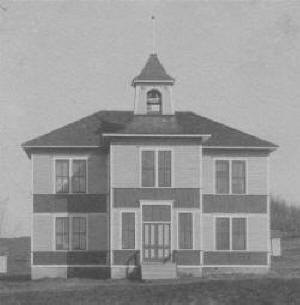 Some country school buildings were moved in and used as classrooms until the new brick building was completed in January 1917 at a cost of $60,000. It was built on the north side of King Avenue on the hill overlooking the town. On moving day, each student carried his own books to the new building. When cars were used as school buses, the driver furnished the car, labor and all expenses for $35.00 a month. Drivers owned their own buses until 1957. Parent-Teacher Association meetings were held on Monday night with grad school programs and fund raising events. There were alumni banquets until 1963. Two or three classes get together for reunions to this day. A school paper was put out by upper classmen call the Bradgate "B". The school colors were black and orange and the emblem was the hawk. In 1953 a new gym-auditorium was built on the west side of the school at a cost of $41,000. It had a capacity of 350 spectators and was used for basketball games, school programs and P.T.A. meetings. A new scoreboard was donated by the Bradgate Progress Club. The scoreboard has since been put to use at the Wolcott Center of the Gilmore City-Bradgate School. The old gym was converted into a hot lunch dining room with the kitchen built under the east balcony. In 1959 it was voted to reorganize with Gilmore City. First through sixth grades were held at the Bradgate Center and junior high, senior high and kindergarten at the Gilmore City Center. School colors are black and white and the emblem is the rocket. An individualized study called PLAN began in 1973 at the Bradgate Center. Two hundred twenty students in grades one through six had eight teachers, four aides and the principal, Art Allen. The school was remodeled for the open classroom. This continued until declining enrollment forced the school to close and all classes to be held in Gilmore City. The brick building was torn down in 1973and the gym was purchased for private use. The first year the new consolidated schoolhouse was built, the winter of 1916-17, the boy's basketball tournament was held in the new gym. Our boys got beat the first game by Bode. One time our team was playing at Renwick so Len Ripperger took us there in a bobsled. There was plenty of snow on the ground when we went but it rained while we were there and going home, there was very little snow. We walked part of the way home to relieve the horses. The boys I remember being on the team were John Logan, John Kirby, Duane Jolliffe, Harry Benjamin, Vic Madsen, Harold Hemerson and myself. One spring there was a track meet in Humboldt. A group of young high school kids was going with George Wolcott in his big Chalmers. The car was large enough that there were two little extra seats between the front and back seats. The other kids going were Dorothy Larson, Beryl Dickey, myself, and two others. I don't remember for sure but think maybe Margaret Kizer or Agnes Hammond and one other boy. The superintendent, C. D. Kizer, wanted to go too so he got into the car with us. We let him off at the fairgrounds where the track meet was held. Then we proceeded on our way. Later in the evening when we started for home, we did not see Mr. Kizer anywhere. Thinking he had gotten a ride with someone else we went without him. When were were about half way home, we came upon someone walking and it was Superintendent Kizer. We stopped and asked if he wanted a ride. He got on the fender and rode there but would not get inside the car. There was not one more word spoken among the group the rest of the way home.